Call Me Old-Fashioned | Self-sufficiency ‘how-to’s and experiments. I pray this doesn’t make it. I hope that someone sees that taking away the rights of the small-scale grower from selling their produce will make hard times even harder on many of us trying to survive in a decayed economy. Why, oh why, would they hinder the american public from making money any way they can in a legitimate and legal way? How will we be able to eat locally if they manage this? The second page mentions that most of these types of bills don’t make it out of committee, let’s hope they’re right. I have scoured the ‘net on how to make your own salt, common sense not withstanding. The one piece of information I found was extremely simple, so get ready to gather up some local saltwater. Filter your sea water through cheesecloth and boil in a stainless steel pot. Three liters of saltwater takes roughly two hours to boil down (Testing this myself, I will have to wager a guess that this is on a gas stove, not electric). Do not let it get bone dry, let it remain a little moist. Apparently the above method can leave behind what is known as ‘bittern salts’ which, unsurprisingly makes the salt bitter. 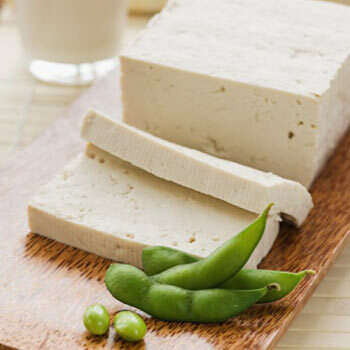 The bittern, however, is one of the best ways to convert soy milk into tofu. 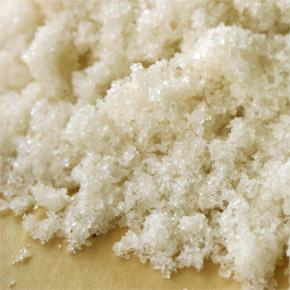 To remove bittern from boiled sea salt, the salt should be suspended over a catching container in a humid atmosphere and the bittern will sweat itself from the sea salt and into your bowl or pot. The salt is then perfect for consumption while the bittern is ready to use in making tofu once re-boiled and made into crystals. The bag was referred to as a ‘hessian’ bag, but in doing a quick research I’ve found that hessian is burlap. If the burlap is too coarse and won’t hold your salt, I imagine a finer weave would be better. Another method of making your own sea salt would be to set a cookie sheet of the saltwater outside in the bright, happy sun and let it evaporate economically, instead of expending any energy you have to pay for. This is not always possible, say, for people like myself that live near the Washington coast where being overcast or rainy is rather prevalent. And yes, folks, that’s all there is. This will probably be the shortest article I will ever write for the foreseeable future. I will try again soon, details of the first attempt are below. 8-2008: Early this month I brought sea water back from Point No Point with high hopes. I thought: ‘Hey, I’ve got this in the bag, I’m well-armed with knowledge.’ My reading had prepared me for a long wait, but ten minutes into a movie I set to watching to bide my time and the smoke alarms in my house started screaming to high heaven. The kitchen was smoking, my salt was unsalvageable with all the ash now present. I made an important note: Electric stove tops are much faster and you have to watch the damn pot. Lesson learned. Hopefully I can try another batch soon. We’ve all heard the phrase ‘cover crop’ at some point in our lives, we may have even vaguely understood the concept. Most of us, however, have never heard of ‘green manure’. In fact, most of us upon hearing the phrase vividly imagine a steaming pile of mutant green that we would rather have not pictured. Some people think that they are one and the same, though they are not. What they are, however, is of great benefit to any farmer or gardener and I’m here to explain why. Cover crops and green manure crops share many of the same vegetation: various clover species, grasses such as barley and buckwheat, and virtually every member of the legume family (of which, strangely, clover is a member). They both have the benefit of enriching the soil with their roots, prevent soil erosion, help retain water, and disallow weeds to grow because there’s no space to. 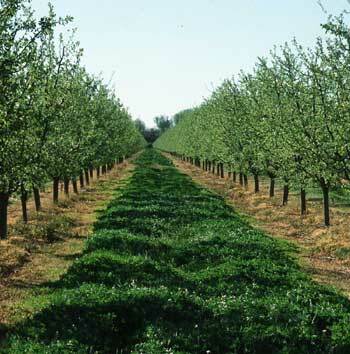 The fundamental difference between cover and green manure crops is this: the latter is tilled under while still green to further enrich the soil with it’s decomposition. Essentially, you’re composting right there in the dirt, raising the nutritional value of the soil for years to come. Be it that you have the worst soil on the planet or not, by growing a crop of ryegrass or clover you will improve it, and by tilling it under, the benefits are at least doubled–plus the loosening of the earth by tilling and root systems will make it vastly easier to dig into. If the wagon is jumped on in early spring, a crop could be tilled under three times in a summer, effectively enriching your plain old backyard dirt into the envy of gardeners everywhere. Where’s the downside? Well, my dears, it’s time. A single summer producing three enriching crops is fabulous, but the most productive growing season is sucked up by it, and no fruits or vegetables will be had until the following year. Enriching can be a slower proccess, by utilizing the winter months for this variety of enrichment. The winter months are typical unproductive, however by plating green manure crops in fall and letting them winter over, can be tilled in when spring arrives. After two or three winters your soil will be as magnificent as a single overly-productive summer. Cover crops are also used during the prime growing months to crowd out the seeding of weeds. ‘Under-cropping’ corn with fava beans will save you hours of weeding through the spring and summer and yeild you beans for dinner more than a few times. Planting clover between the rows of your carrots not only keep the weeds out, but rabbits prefer eating clover to carrots and will tackle the plants you don’t care about instead of the ones you do. Even better? Seed for cover and green manure crop are unbelievably cheap. A two-pound bag of crimson clover goes for ten dollars at your local farm supply. A two-pound bag of annual ryegrass only six. A very small price to pay for improved, no-erosion soil and no weeds. When the crop turned under in the spring, make it’s done roughly a month before you intend to plant anything. The process of breaking down the green matter takes a lot of energy that your plants will have to compete with until it’s done, making it a risk for developing plants. Typically all members of the legume family enrich the soil uniquely by taking nitrogen from the air and distributing it into the dirt, nitrogen is important (and often depleted by growth) for anything that wants to grow in the soil. They also tend to grow deep roots, which naturally helps loosen the earth via their growth. The drawback of legumes is that they often don’t have enough organic matter to enrich the soil that way. Grasses add a lot of organic matter, but no exceptional nutrients like the legume family. My personal opinion is that a mix of grasses and legumes are an optimum marriage for any space. The following is a list of cover crops and their benefits as well as special needs, should there be any. Loam, fairly fertile soil; needs warm temperatures for germination; lime if pH is low; hardy; drought-tolerant; inoculate. Prefers medium-rich loam soil; lime if pH is low; not as hardy as rye; tolerates drought. Must leave part of garden in cover crop during growing season; grows quickly; not hardy. Fixes 2-3 lb N/1000 sq ft/yr. Not reliable hardy or drought-tolerant; lime if pH is low. weeks. Use small-seed rather than large-seed table types. Will grow on many soil types; medium drought tolerance; likes cool weather. Inoculate with bacteria as for other legumes. Not hardy; tolerates low pH. Very hardy; can plant until late fall/early winter. Fixes 2 lb N/1000 sq ft/yr. Slow to establish; fairly hardy; till under before it seeds; can become a weed; inoculate seed before planting. Other varieties that can be used but that I couldn’t find enough information on are Lupins, Rapeseed, Sudan Grass, and other legumes like peas and other beans. This subject is neither a success or failure as of yet, the process is being outlined below. 8-28-2008 : Tilled most of my approximately 600 sq ft of ground with a self-propelled, rear-tined tiller (rented at 25 dollars an hour) for two and a half hours. Soaked the overturned earth with water and spread a combination of 2 lbs crimson clover and 5 lbs ryegrass (all costing less than ten dollars) by hand in broad horizontal arcs. (I hope this is what they mean by ‘broadcasting’ the seed.) It is much harder than one imagines to evenly disperse seed over such a large area. I will try to keep the ground moist until established (hoping for rain). There are pictures to come. 8-31-08 : It’s been four days, and despite some small birds often being caught eating the seeds at the very bottom of my yard, I have been persistent in keeping up with the watering with great rewards. I was so delighted the day after tilling when I discovered that all of the tiny clover seeds had matching tiny white threads trailing from them. Now on day four there are tiny, adorable green leaves poking their heads out to see the world and the rye seeds have threads in the ground. I feel like a proud mama. 9-6-08 : It’s been another week and my clover leaves are bigger and the rye is over two inches tall. When the latter first sprouted they were a dark red color and now they are a vibrant spring green. I have not had to water them the last four days with no signs of ill effects and hardly any rain. I still can’t help but smile when I look out at them. For long-time fanatics of bread, like myself, there is much to be said about the glorious, golden grass that yields our favorite staple: flour. Pastries, pasta, pancakes, waffles, pizza crusts, even gravy are all testaments to the glory of flour, so wheat has a place deep in the hearts of millions of people the world around. Also, with wheat prices rising due to droughts in Australia and China, and more and more fields being turned over to meat production, it’s being called into question weather the price of lovely starchy staples will soon be soaring. Not to mention, it’s a great way of knowing what’s going into your bread. So it’s a delight for someone like me to learn that growing your own wheat, harvesting, and grinding it are not complicated and out of reach. Growing is pretty straight forward and harvesting as easy as string, a pillow case, and some wind. Grinding is affordable in hand-crank form, available online for roughly $60 (Back to Basics brand). So what stops us? Well, the desire to, of course, but if you didn’t want to you probably wouldn’t be reading this seriously, so I’ll assume you’re as crazy as I am. A year’s worth of flour to regularly bake bread is 100 sq yards (300 sq feet) per person, for a whole family that can get pretty suffocating and space can be incredibly short. However, for the kicks of saying you ‘made this bread yourself from your own flour’ every once in awhile it’s worth a sizable patch of garden space. Also, I was surprised to discover how little an inconvenience that would actually be in my own backyard. Go on, take a trip back there and give it a measure. Bonus for those in the south: due to your warmer climate, southerners can often reap the benefits of harvesting two crops in a season and will therefore only need half the space to get the same amount of wheat. To grow, clear and rake the earth where you intend to cultivate your wheat, planting in the early spring (March-April.) Under-planting with clover will leave no space for weeds to grow, will be an excellent source if you keep bees, will help retain moisture, and are preferred to be eaten by rabbits even over carrots. Harvest comes in the fall (August-September), and for those southerners I mentioned, another crop can be harvested in the April following. Keep the wheat watered but not wet. The benefit of growing such a small crop, as opposed to mass production, is that the risk of disease and pests are much lower. It’s also easier to catch the trouble sooner and be dealt with in a healthy, organic way rather than chemicals. You’ll know the wheat is ready to harvest after it has turned golden and the grains are hard when you try to bite into them, if soft it still needs a few more days. While a scythe is the traditional way to harvest, one source points out that it’s easier for a backyard outfit to tie the wheat into bundles: first below the heads and second half a foot above the ground. An electric hedge cutter can then be employed to cut the bundles free, leaving two to three inches of stubble. To get your grains, pull a pillowcase (or other cloth bag) over the bundled heads of wheat. Holding firmly to the stalks (if using a pillow case, make sure that it is closed tight around the bundle) and beat the living hell out of it against a very hard surface, such as a brick wall or boulder. To get the grains one must ‘winnow’. There are one- and two-person methods. With two of you you can get more of the grain winnowed at once, using a sheet held between you and gently tossing the grains and chaff on a breezy day, or with a fan set on low, to blow away the lightweight chaff, leaving the heavy grains behind on the sheet. With one person you can use a large, flat basket, described elsewhere as ‘like one used for winnowing rice’, I gather that it’s flat and broad. Toss it up and catch it in the basket, effectively doing the two-person job in smaller batches. Storage is a snap, since the grains will essentially last forever. Okay, not forever, but for years, certainly. Use an airtight container in a cool, dark, dry place set away from strong-smelling foods (as it can absorb them.) If you want to use some of the grains to grow wheat next year, make sure to set it aside now so you don’t accidentally grind it in pursuit of some scrumptious bread or another. When it comes time for flour, go ahead and use a mill, as mentioned, or even a coffee grinder. I must warn, though, depending on the type of coffee grinder, it would create an unreliable texture. Also, if you want your coffee (or wheat) to taste good, I would not use the same grinder for both. If using a nice-quality coffee grinder for wheat, please dedicate it solely to the grinding of flour. 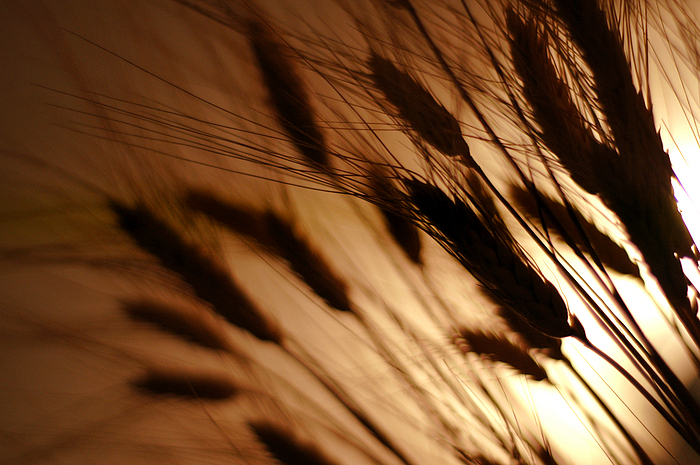 I have yet to grow wheat myself, when I do I'll add my own wisdom to the above. Also known as ‘fromage blanc’, farmer’s cheese is extremely easy to make and easily replaces such items as cream cheese or cottage cheese. And while there are slightly more complicated recipes out there on the net this one is the easiest for a modern kitchen to manage if, say, you wanted to walk into the kitchen this very instant and give it a try. I’ll go into culturing your own buttermilk in a later post, I’m afraid it is necessary for this process. At least this recipe does not call for ‘rennet’, which is the necessary chemical in making harder cheeses. If anyone would like the recipe for farmer’s cheese made with rennet, let me know. It helps if you have a heavy-bottomed pan, meaning there is a thick pad of metal on the bottom of the pan you’re using, this helps distribute heat more consistently when you’re trying to make cheese. Apparently aluminum is not a good choice for cheese making, stainless steel or enameled would be best. Pour in your milk and stir it consistently so that it doesn’t burn, bringing the milk to 175 degrees Farenheit. You will know when you’re getting close about the time there’s steam and little bubbles on the rim of the milk. A thermometer will do you best, however. At this point, pour in your buttermilk and lemon juice and turn off the heat, continuously stirring gently. You’ll see it begin to break down into curds and whey, if it hasn’t after thirty seconds add in a little more lemon juice. Set aside to settle, undisturbed, for ten minutes. In the meantime, grab your colander or strainer (a colander will not let whey out as quickly, this only means the process will take a bit longer), set it in the sink and line it with your cheesecloth (my main source site uses four layers.) A handkerchief would work, likely in a single layer, since it has a finer weave than cheesecloth. Gently pour or ladle your curds and whey into the lined strainer and allow it to drain for roughly five minutes. Gather up your cheesecloth and tie a piece of string around the neck, and then said neck to a wooden spoon that will be set across the mouth of your pot. 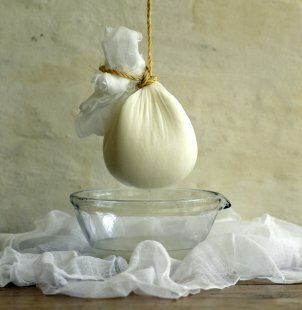 Let it hang in your pot (nothing should be touching the draining cheese except at the neck from which it hangs) and allow the whey to drain for another half hour. When you unravel your cheesecloth you will have soft cheese. Go ahead and salt your cheese now, mixing it in, and mold it should you choose. You may also add herbs to it if you like. The cheese is edible right away, or you can chill it before hand. Interesting note: the whey can be saved to make ricotta (to be an article later). This is a very similar process to making ‘labneh’, a middle-eastern cheese made from yogurt. Now, enjoy! When I have first-hand experience, I will add more information! Woohoo! The first and most important thing to know about making soap is that the process of making it requires that the user come in contact with lye. It is an alkali described as ‘caustic’, defined in the dictionary as ‘capable of burning, corroding, or destroying living tissue’. Never fear, however, with all of the people that have and do make soap, the warnings given everywhere you read about making soap are clearly easier to overcome than they seem. As a further warning: never make soap with children or feeble-minded people in the area. Firstly, let’s go over precautionary measures. Bases and acids are the extremes on the pH scale, both are harmful but when mixed together they become inert. Keeping vinegar on hand at your work station will make a handy helper should you somehow manage to get the lye on your skin, my personal recommendation would be to pour it liberally over the burning area should you have contact. Of course, prevention is better than having to fix a problem and you should therefore protect everything in sight. Lye will not only harm your flesh, but weak plastics (including your counter), clothing, teflon, and react badly with most metals (including aluminum and it’s foil counterpart). Lye should only ever come in contact with glass (Pyrex is best), rubber, iron, ceramic, or stainless steel. If you don’t know what your pot is made of–don’t use it. All of that said, I hope you’re ready to make some soap! We will be using the cold-process, since the hot-process takes longer and results in an ugly soap that you cannot add scents to and does not come out smooth. The oil you choose can be vegetable based, or you can use strained animal fat. Vegetable oils most commonly used are: Coconut oil, olive oil, almond oil, and soy oil. Coconut oil makes, hands down, the best-smelling soap followed closely by almond oil, but both are expensive. Olive oil is the gentlest and most moisturizing, used in baby soap and shampoo, and using pure olive oil is referred to as ‘castille’ soap. Pure olive oil is, surprisingly, cheaper than the sort you find in the grocery, the closest you can get to pure at the grocery is extra-virgin. Soy oil is the cheapest of the oils and is usually labeled as ordinary vegetable oil. If using soy, be sure to check the label for ‘100% soy oil’ just to be safe. Whichever oil you use the finished product usually comes out smelling like it. Most oil can be made into soap including corn and sunflower, they are merely not as commonly used. There have also been mentions of making soap with vegetable lard or beeswax. To use clarified animal fats, one can melt and strain your saved bacon grease or cooking lard and repackage it as soap, though I imagine it wouldn’t smell quite as delightful as a vegetable oil. It also does not lather quite as luxuriously. Lye used to be easily found at the grocery store as ‘Red Devil Lye’, but research shows that the company went out of business and that 100% lye can be found at Lowe’s in the drain cleaning aisle under the Roebic brand (it contains dry lye crystals). However, do not use Drano, or anything less than 100% for that matter, as it will add in other chemicals that will be disastrous for your soap or skin. I will be writing an article on how to make your own lye in the future, so keep an eye out, but in the meantime look for the ‘100% lye’ on the label and don’t use anything less. Now that you’ve chosen your oil, spread out the newspaper thickly over your work surface and protect every last inch of your skin. Measure the water into a glass or ceramic bowl and very carefully measure the lye into a coffee mug or small pyrex bowl. Do this over the sink, and if a single drop/crystal falls wipe it up immediately with a paper towel and throw it in the trash as water and lye react badly with one another if not controlled. Warning: Always add lye, or a lye solution, to another ingredient and never the other way around or an explosion could occur. Carefully take your bowl of water and mug of lye outside, well away from confined spaces and open windows. Set the bowl on the ground and stir the water with your spoon as you slowly pour in the lye. Hold your breath during this process and lean your face back and away from the toxic gas fumes. If you need to breathe, set the lye down and walk at least five feet away and breathe as much as you need to, any nearer and you might inhale the fumes which has been described as painful. Once the lye is in the water it will begin to get very hot so avoid touching the bowl. Should the lye harden on the bottom of the bowl just continue stirring and it will eventually dissolve. Leave the lye and water outside and return to the stove to heat your oil to 110˚F. The best way to gauge this without a thermometer is to bring it just before boil, when you see little bubbles forming on the bottom of the pot. Remove it from heat and place it in the sink. By this time your lye should no longer be emitting fumes and be at a temperature of 110˚F, you should able to carry the bowl at this temperature. Pour the lye very slowly into the oil, making sure that both liquids are at the same temperature. Don’t let it cool too much since you need the heat for the soap to be formed. Use the hand blender to thoroughly mix the liquid until you reach ‘trace’. I am told that the moment of first trace is obvious, the change in the liquid as it thickens. It is the point when you can scoop out some with a spoon and pour in back in with a little remaining on top as with pudding. Trace will take 30 minutes to an hour to achieve with liquid oil. Use the mixer for 5 minutes at a time every 15 minutes until trace occurs. Once trace is achieve, scents or herbs can be added. Two tablespoons of essential oil for the amount of this recipe should be about right. When adding herbs, do not expect them to make much of an impact with smell in the finished product. Do not use more than 3/4 c. of herbs or the soap will be unable to hold itself together. With trace and any extras added, it’s time to pour the new soap into a mold. It’s not necessary to use an expensive store-bought mold, a well-lined piece of tupperware, box, or empty carton will do nicely. When using a box or tupperware, line it well with waxed butcher paper. If the new soap leaks it will still damage things it touches as the lye has not fully set yet. Wrap your mold in a junk towel or two and place it somewhere where it will not be disturbed for one week. After a week, uncover the box and slice the soap into bars. It should be the consistency of chilled fudge at this point, if it’s too soft, recover your soap and place it in a cooler place for another week. When you cut the soap, wear gloves, as it’s still caustic until fully cured. Use a butter knife, hand-held vegetable slicer, or wire to cut the soap–a wire will make the smoothest cuts. Once sliced, place the bar on a paper plate or piece of cardboard to dry for one more week. After a minimum of four weeks the bars will be ready to use, however the older the soap is the better it gets. Reportedly, a bar of soap is at it’s best after curing for one year. if you have dry skin, you might try ‘superfatting’ your soap. This can be achieved by adding in an extra 1/4 or 1/2 cup of oil to the recipe, or adding vegetable glycerin to the traced soap. Artificial oils such as petroleum jelly and petroleum wax will not saponify into soap. However pretroleum jelly does help as a protective barrier against lye. Don’t try to put toys or unnatural items in your soap, the lye will destroy them. Gift wrap soaps rustically with parchment paper or ribbon. 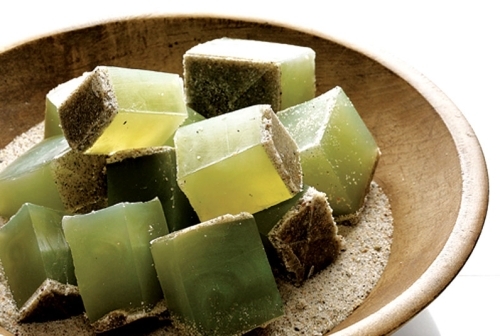 Animal fat soaps usually don’t make as rich a lather as vegetable-based soaps. Adding color to soap is sort of experimental. Food colorings usually deteriorate in lye, vegetable dyes like beet or blueberry juice usually don’t look the way you expect, earth pigments or wax colors are the most reliable. Exfoliating soap are easily made by adding in a natural grit after trace such as oatmeal, wheat germ, sand, poppy seeds, and clay. If using clay or sand, use very little as they can clog up your pipes. Check out the recipe page linked at the top of the site for soap variations. More information will be added when I have first-hand experience.